Are you looking for quality contracting work? Golden West Exteriors is a contracting company in Edmonton, and we do roofing, siding, and even windows and doors. When hiring a contractor, it is important to choose someone that stands by the quality of their work (you will be living with it for a long time). Golden West Exteriors was picked by Homestars as the best contracting company three years in a row, and we always encourage people to talk to our previous customers for recommendations. One of the services that we offer is cedar shake roofing installation in Edmonton. If you are unfamiliar with this roofing material, it is a great option for many homeowners. We go over its benefits here. Cedar shake wood is a natural insulator. If you think about it, insulation is just about the main use for a home (protecting us from the elements). A cedar shake roof will both keep the warmth in your home during the cold season, as well as keep the warmth out during the warm season. This allows you to reach a comfortable temperature in your home without using the same amount of energy on HVAC costs. For the homeowners, this translates into savings every month on their energy bills. Cedar is known as one of the toughest wood materials used for roofing. The average cedar shake roof will last a good 20 years with proper maintenance, and may last a good deal longer with proper installation. Adding air circulation to the cedar shake roof by putting a breathing layer in between the shakes and plywood sheathing can increase the lifespan of a cedar shake roof. Because of their hardiness compared with other roofing materials like asphalt roofing, they tend to weather storms better than some other materials. Some of the durability features of cedar shake include a resistance to moisture, ultraviolet light, insects, and wind. It can also be treated to be resistant to fire, fungus, and moss growth as well. When cedar wood is cut into cedar wood shake pieces, the pieces are long and lightweight with straight graining patterns, and they have a uniform texture. Altogether, this makes cedar wood extremely easy to cut, saw, and nail. Add in some pre-assembled hip and ridge units for convenience, and you have a fantastic finishing touch at great convenience. 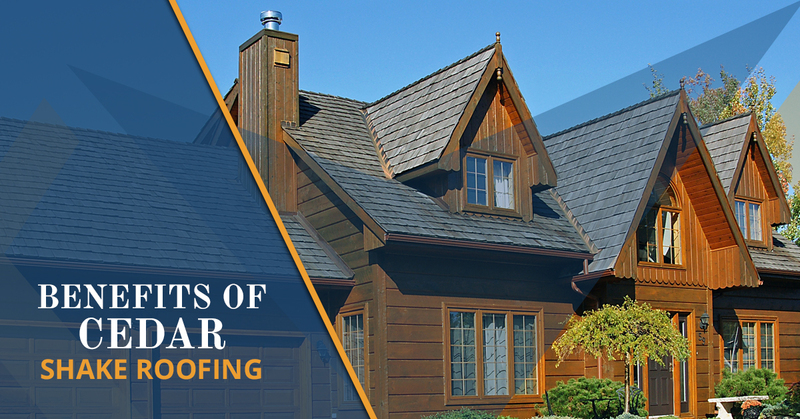 Depending on what exactly the specifications of your roof are, there is a good chance that its installation will go easier than many other material types, barring asphalt shingles. The movements of a building can destroy a home without the proper roofing material. The more a building tends to move, and the heavier a roofing material is, the bigger the chance that there will be structural damage to a home. That is why cedar shake works so well for so many homes, because it is extremely low density and light weight. Because it maintains its dimensions even in the presence of moisture, you don’t have to worry about shrinkage causing damage to your roof. Aesthetic appeal is where cedar shake roofing material really shines. Which says something, as it has about the same lifespan as asphalt shingles, but with a higher upfront cost. If you are wondering how it could cost more than asphalt shingles with the same lifespan and a longer installation time, it is because it looks fantastic. Really, there is a world of difference between cedar shake roofing and most other roofing materials. It fits great with any architectural style, provides a rustic appeal, and greatly improves the curb appeal of any home. There are many different style options that come with cedar shake roofing, like single width, multi width, and fancy shake. As with all roofing materials, there are considerations you should take into account before making a decision. Unlike metal and slate roofs, which also have a higher upfront cost than materials like asphalt roofing but also a longer lifespan to offset it, cedar shake has a higher upfront (not as much as metal or slate) cost without much longer of a lifespan. So, if the aesthetics of cedar shake do nothing for you, it may be a good idea to shift your attention to other materials instead. Another issue to consider with cedar roofing it that it tends to require a significant more amount of maintenance than other roofing materials. However, if you decide to treat your wood to prevent moss, mildew, and mold growth, you can mitigate these maintenance needs, paying a little more upfront instead. Finally, you want to be sure that you contractors are honest and knowledgeable about their profession; nothing can destroy a roof faster than improper installation, no matter what roofing material gets used. Hopefully this article has piqued your interest in this great roofing material option if you are looking for a new roof. Here at Golden West Exteriors, we are proud of the quality of our work; just ask one of our previous happy customers! Want to know what other people are saying about us? Check out some of our testimonials. For more information about our company, please do not hesitate to give us a call at your earliest convenience. One of our friendly and knowledgeable representatives will be happy to answer any questions that you may have.